We also like shortcuts. We want what we want NOW. Not months from now. Certainly not years. We want it now and get frustrated and angry and disheartened when things don’t happen in the timely fashion we desire. 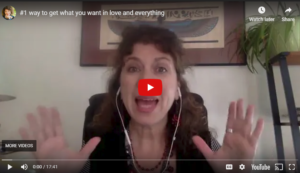 I just did a Facebook live on the #1 way to get what you want in love or anything else you want. Click here to watch. In it, I speak about getting real. You need to get really honest with why you are where you are and look at what really is stopping you. Getting honest with your current circumstances is huge. To be able to get some traction toward Next Level Love, you need to see what is working and what isn’t. You also need to have a clear destination of where you are headed. Once you can see where you really are and how you are stopping yourself from moving forward, things can change. You need to be able to identify the old programming and B.S. (belief systems about yourself that are untrue) that are calling the shots. What I want to offer to you is this… be gentle with yourself as you explore your current state of affairs When you peek under the covers and see how you are holding yourself back and see the cost of these behaviors, you can have a tendency to beat yourself up. Don’t! Be proud of yourself for having the courage to say hey, I want a great life and I am looking at what is possible. Know that you can choose differently. That is way cool!!! ← If you’re stuck… here is the antidote!